We updated our service today with several major changes that make Kitely cheaper to use, and add new ways to earn Kitely Credits. We’re making several changes to our subscription plans. People have told us that they prefer to be able to spend more time in-world instead of getting additional Kitely Credits each month. Therefore, we increased the amount of free time included in each plan, and eliminated the KC that they used to provide. The Bronze Plan now includes 30 hours of monthly use (as Minutes) instead of the 25 hours that it previously provided (in Minutes and KC). Similarly, the Silver Plan now includes 120 hours instead of the 100 hours that it used to provide. This means that the new Bronze and Silver plans provide 20% more time for the same amount of money as before. The new plans will take effect automatically for all existing users on August 1. The most exciting changes, however, are in our more advanced plans. We’ve eliminated the Platinum Plan, and changed the Gold Plan to include 20 free regions and unlimited time for just $35 / month. This means that you can now get unlimited time on Kitely for 65% less than what we previously charged for the Platinum Plan. Existing Platinum and Gold plan users can continue using their existing plans if they wish, but we recommend switching to the new Gold Plan since it’s cheaper. In preparation for when we start providing bigger worlds, this update also includes a few world-related price changes. The price for creating a world is now 10 KC (up from 1 KC). Similarly, the price for storing a world is now 10 KC per day, instead of 1 KC per day. This means that each additional world beyond the worlds provided by the plan’s free quota costs about 300 KC per month, which is equivalent to $1 per month when buying KC at our best discount price. As before, users aren’t charged for creating or storing worlds that are included in their plan. It is now possible to buy up to $500 worth of Kitely Credits at once (up from $50). As will be explained later, there is a new use for KC so some people will want to buy many of them at once. This change makes it more convenient to do so. New Free Plan users now get 6 hours of free usage in the month in which they create their account (up from 2 hours). This time is only usable in the first month; afterwards Free Plan users get 2 hours each month, as before. PayPal – your PayPal account will be billed at the beginning of each month. This is how Kitely has worked until now. PayPal, or Kitely Credits whenever possible – at the beginning of each month, if you have enough Kitely Credits then you will be charged using KC at a rate of 300 KC per $1. Otherwise, your PayPal account will be billed. 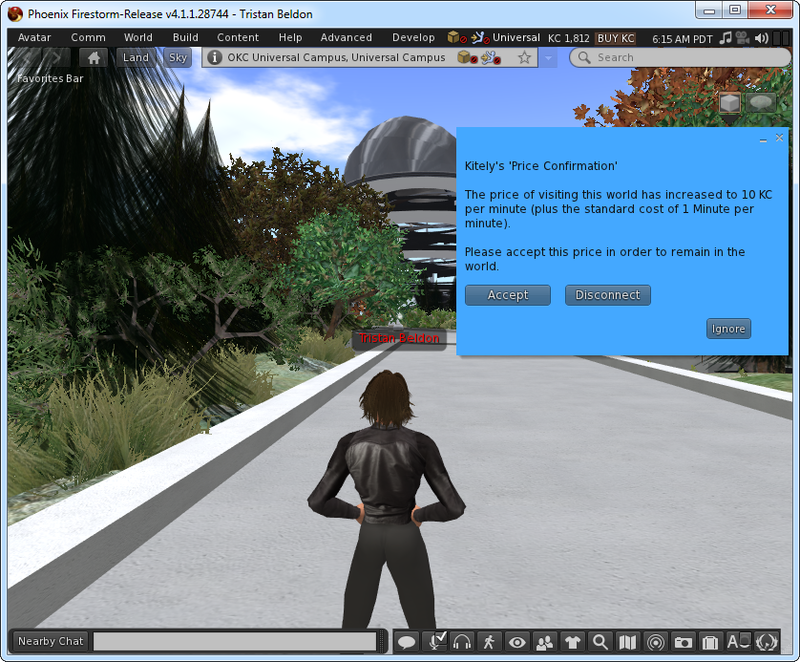 This option is useful for virtual world business owners: it enables them to use the KC that they earn in order to pay for Kitely. People who earn enough KC won’t have to pay for Kitely using real-world money at all. Only Kitely Credits – you will be charged using KC at the beginning of each month. If you don’t have enough KC then your plan will be canceled. This option isn’t recommended because it can cause you to lose your plan just because you happened to be low on KC on a particular month (although we do send a warning email before that happens). This option is intended for people who prefer paying for their plan multiple months in advance, and for people who can’t use PayPal subscriptions because they didn’t link a credit card to their PayPal account. If you want to use this option then you should buy a large amount of Kitely Credits in advance, to avoid running out. This is why we increased the number of Kitely Credits that can be bought at once. In addition to charging users for visiting your world, you can also pay users who visit your world. This can be used, for example, to automatically pay performers for the time they spend performing in your world. This means the performer can create a direct connection with the world’s visitors before asking them to pay, which increases the chance that they’ll want to stay. 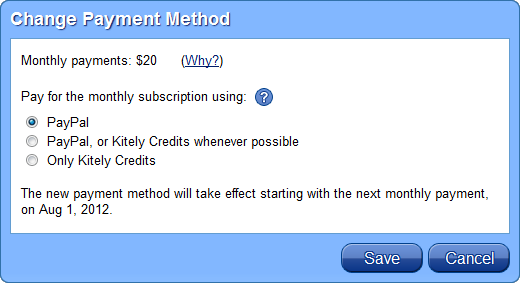 Kitely charges a 10% fee for Kitely Credits that are earned using these monetization options. In other words, for every 10 KC that the world manager or performer earn using these tools, they get 9 KC and Kitely keeps 1 KC. This fee doesn’t apply to any of the other ways people can transfer KC to each another. The 10% fee applies only to the optional monetization features described above.